Complete ROG PC system that outclasses and outshines the gamers’ conventional setup with total synergy of ROG component products and gaming technologies. 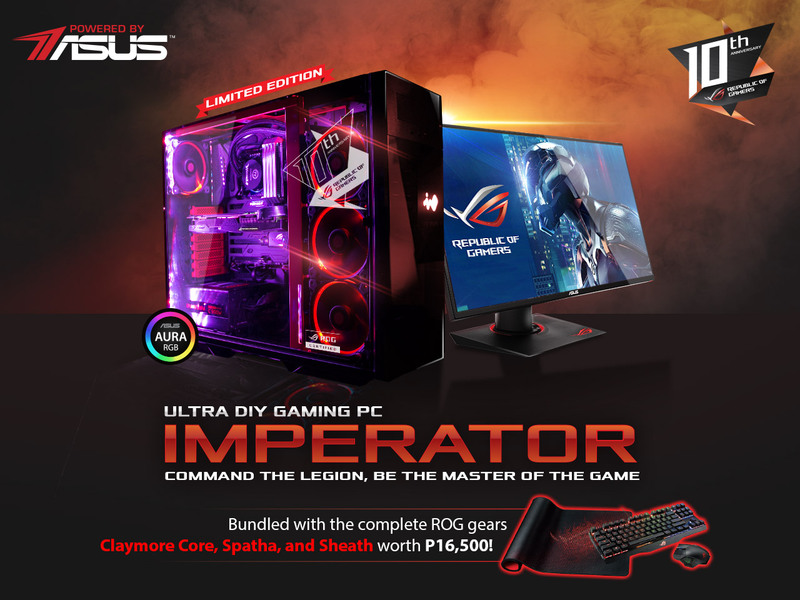 ASUS Republic of Gamers (ROG) Philippines announces the ROG Imperator Ultra Gaming DIY PC, a full gaming desktop synergized with the best ROG components and peripherals available in the market. As the supreme commander of the Roman Army, the Imperator brings legions to victories. ROG is bringing supreme gaming dominance with its own ROG Imperator gaming PC, complete with ROG components and gaming gear. The desktop is as powerful and as colorful as it gets. With the Maximus VIII Formula powered by the Intel Core i7-6700K, an ROG Strix GTX 1080, and high-capacity memory, gamers are sure to maximize the settings of widely recognized AAA games. With a massive 2TB hard drive storage and a 240gb ssd, slow game loads will be a thing of the past. ROG Peripherals bring out your full potential. With the technology advancing nowadays, the old saying-whatever works, works-are long gone. Every click and input lag gives a difference in winning a Million Dollars to a Hundred. Every purchase of the unit entitles customers with the much-awaited ROG Claymore Core RGB mechanical gaming keyboard, ROG Spatha Wireless / Wired RGB gaming mouse, and ROG Sheath gaming mousemat. Using the latest 6th Generation Intel Core processors and high capacity DDR4 modules, the Maximus VIII Formula can now fully future-proof their systems with best-in-class cooling, aesthetics, gaming performance, and next-gen connectivity. To create gaming cooling that is the best in its class ROG teamed up with the cooling masters at EK Water Blocks to develop CrossChill EK — exclusive to Maximus VIII Formula. Maximus VIII Formula is also the gaming motherboard that delivers style, strength, and cooling in one, with all-new Aura RGB LED illumination and tough ROG Armor for overall protection with style. Maximus VIII Formula also eliminates the hassle of using external RGB controllers to create striking illumination and perfect color sync with an integrated Aura RGB-strip header and included extension cable. Maximus VIII Formula extends ROG’s boundary-busting heritage to stretch performance further than ever before, with the best overclocking (OC) design, friendly and multi-award-winning UEFI BIOS, unmatched overclocking opportunities using the 5-Way Optimization software, and crystal-clear gaming audio with SupremeFX 2015. The ROG Strix GTX 1080 is one of the most powerful graphics card in the market. Equipped with ASUS DirectCU III cooling technology, which features direct-GPU-contact heatpipes achieving up to 30% cooler gaming performance. DirectCU III technology includes dual 0dB fans and a patented wing-blade design that delivers maximum airflow and improves static pressure over the heatsink by 105%, while operating at three-times (3X) quieter volume than reference cards. ROG Strix GTX 1080 also comes with ASUS FanConnect technology that lets gamers directly connect case fans to the GPU using a four-pin connector to provide targeted supplemental cooling for optimal thermal performance. All ASUS graphics cards are now produced using Auto-Extreme technology. It’s an industry-exclusive, 100%-automated production process, ensuring consistent graphics card quality as well as improved performance and longevity. Display that gives immersive details and visuals. The ROG Swift Series is designed to provide the fastest and smoothest gaming experiences imaginable. ROG Swift PG279Q is the world’s first display with a 165Hz refresh rate to reduce lag and motion blur, giving gamers the upper hand in fast-paced first-person-shooters, racing, real-time strategy, and sports games. Users can select between 60, 120, and 144Hz refresh rates on the fly with the help of the Turbo Key. Users can fully experience ROG Swift PG279Q’s 165Hz refresh rate if they’re using a NVIDIA GeForce GTX 960 or higher graphics processor. From the Maximus VIII Formula motherboard to the ASUS ROG Strix GTX 1080 and even the In Win 509 casing, the ROG Imperator has the exclusive RGB lighting technology invented by ASUS. This stunning illumination technology is capable of displaying millions of colors and six different effects for a totally personalized gaming system – in total sync with other Aura-certified products.